$64.00 $80.00 As Low As $1.04 ea. A timeless collection of personalized stationery designed with understated elegance. Stylish correspondence set with blank white envelopes. These white cards are 6.25" x 4.5" with your choice of paper weight. Card offers your choice of motif above the personalization. Your personalization is printed in typestyle as shown in your choice of ink color. 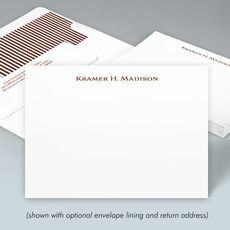 Designer envelope lining and/or printed return address on envelopes is available. Positioning of imprint only as shown. Arrives elegantly packaged with tissue in our classic navy gift box. -- Select One -- Signature Paper - 100 lb. Cover Premium Paper - 200 lb. Cover + $1.80 ea. Premium Paper - 200 lb. Cover + $1.30 ea. Premium Paper - 200 lb. Cover + $1.13 ea. Premium Paper - 200 lb. Cover + $1.05 ea. Premium Paper - 200 lb. Cover + $1.00 ea. Premium Paper - 200 lb. Cover + $0.97 ea. Premium Paper - 200 lb. Cover + $0.94 ea. Premium Paper - 200 lb. Cover + $0.93 ea. Premium Paper - 200 lb. Cover + $0.91 ea. Premium Paper - 200 lb. Cover + $0.90 ea. Premium Paper - 200 lb. Cover + $0.89 ea. Premium Paper - 200 lb. Cover + $0.88 ea. Premium Paper - 200 lb. Cover + $0.88 ea. Premium Paper - 200 lb. Cover + $0.87 ea. Premium Paper - 200 lb. Cover + $0.87 ea. Premium Paper - 200 lb. Cover + $0.86 ea. Premium Paper - 200 lb. Cover + $0.86 ea. Premium Paper - 200 lb. Cover + $0.86 ea. Premium Paper - 200 lb. Cover + $0.85 ea. Premium Paper - 200 lb. Cover + $0.85 ea. Up to three same size initials.